New Jerusalem Baptist Church is a multi-cultural, multi-faceted church dedicated to reaching our community and the world-at-large. Our mission is to encourage and empower individuals with our message of hope, while encouraging the pursuit of opportunity through education, economic empowerment, personal growth, and development. Founded in 1974, New Jerusalem remains a pillar in the north Texas region, and a beacon of light throughout the city of McKinney. 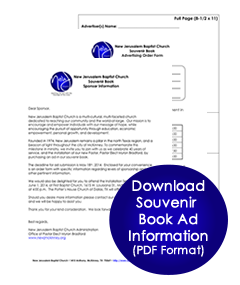 To commemorate this milestone in ministry, we invite you to join with us as we celebrate 40 years of service by purchasing an ad in our souvenir book. Should you desire more information, please contact our office at (972) 838-5906, and we will be happy to assist you. Thank you for your kind consideration. We look forward to hearing from you. For your convenience, we have two options for you to submit your souvenir book ad. To place your order by mail, please print and complete the forms and follow the instructions as directed. 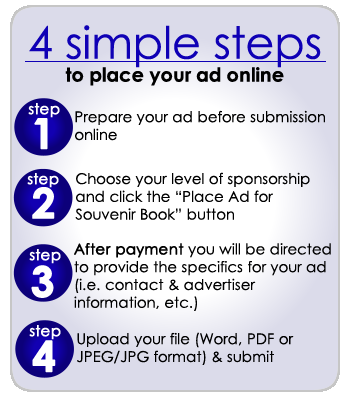 There are 4 simple steps to place your ad online. NOTE: All advertisements containing pictures or images must be submitted in JPEG or PDF format. Congratulatory messages must be submitted in a Microsoft Word document. Verify all ad information is proofed for accuracy before uploading. No handwritten remarks or handwritten ads will be accepted. Submitted images must fit within the selected area. Use the Souvenir Book Ad diagram as a guide. No modifications will be performed to resize images. No refunds will be given after printing is completed. Copyright 2018 | All Rights Reserved | Web services by Curtis Services.